If anyone recalls, back in the day the only way to customize our top notification bars was to root and apply a ROM with a custom theme. That made the process fun, but for those who didn’t know how to root and flash zips, they were left out in the cold and lonely world of stock Android. And frankly, Froyo was kind of ugly. 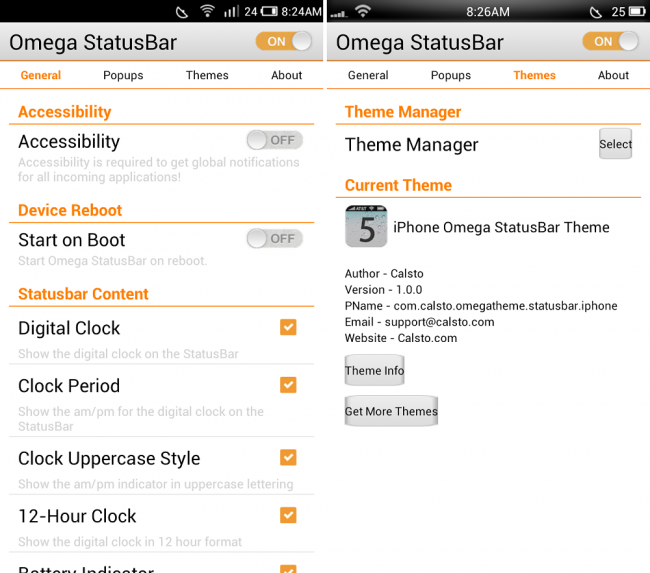 Anyone looking for a custom look without needing root should check out Omega StatusBar. With Omega, your stock bar is replaced by a solid black strip with a more minimal look. Just a clock, battery, and data icon. What you do next is up to you. You can add more goodies or even use the theme manager to make it look however you see fit. There’s a ton of themes that can been downloaded from Google Play to allow for colors, different icons, and more. For someone who doesn’t want to go through any trouble with rooting, but still wants a custom look, check it out in Google Play.